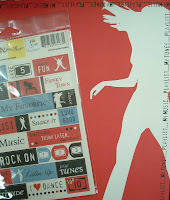 Just wanted to share these fun new papers we got in from Imagination Project: As You Wish & Playlist- aren't they great? As you wish has a very classic feel to it (ooh, it'll look just lovely with the new Sophisticate alpha from QK!) and Playlist is gonna be fab for teens (and people like me who got an iPod for Christmas!) There's fun coasterboard embellishments to match both of them AND they've got a new iPoints program on all their products-- you clip the little 'points' barcode and save em up to get free stuff! Details will be posted on their website soon, but it's nice to have a fun promo like that from a scrapbooking company, eh?